Dubai, UAE, November 23, 2017: In support of new designers' innovations, Al- Jazeera Paints, giant manufacturer of high quality paints in the Kingdom, Middle East and North Africa, sponsored Decofair exhibition award for design during its participation as Platinum Sponsor in the 9th edition of the specialized Saudi International Furniture and Design Exhibition” Decofair”, which was held at Hilton hotel in Jeddah for 4 days during current November. As the CEO of Al- Jazeera Paints Company, Mr. Abdullah Bin Saud Al- Romaih said , the award sponsorship is based on the social responsibility of Al- Jazeera Paints as a leading national company dedicated to discover new innovators and young talents in the field of decoration and interior design throughout the Kingdom. He added: 'Decofair” award for design provides the opportunity for male and female creative to launch their capabilities and to present themselves as contributors to the development of decoration and interior design, adding that:” It’s our duty to enhance opportunities for them to open new and inspiring horizons enable them to achieve quantum leaps and raising building quality level inside and outside the Kingdom”. On the other hand, the company has showcased “2018 colors” consisting of 44 colors with its four axes: 'Authentic Earth,' 'Pure Expression,' 'Cultural Blend,' and 'Precious Nature' ,as well as color paintings, the first expresses heritage loyalty, the second reflects balance and tranquility feeling, the third leads to explore patterns of cultures, and the fourth expresses sense of wealth and prosperity. Al-Jazeera paints pavilion has witnessed a great demand by architects, designers, contractors and investors for its remarkable design and its diversity of displays of various types of paints and color solutions, including the innovative colors of a number of high class decorative paints bundle including Al- Jazeera Worood, AL-Jazeera Rawa’a and AL-Jazeera Ebda’a. In its pavilion, the company also has showcased a range of products including Al -Jazeera Novel group, Al- Jazeera Green products and a number of its exterior products such as: AL-Jazeera Marotex, AL-Jazeera peartex and AL-Jazeera Maxim, products dedicated to wood such as AL-Jazeera Wood Rak, products designed for steelworks like AL-Jazeera Metalo, thermal and water insulator products such as AL-Jazeera thermal insulation system” Dethar”, as well as AL-Jazeera “Cool Roof” thermal and water insulator for roofs, AL-Jazeera Flexi Guard, under tiles waterproofing, and Jaz Tank DW drinking water tanks insulator. 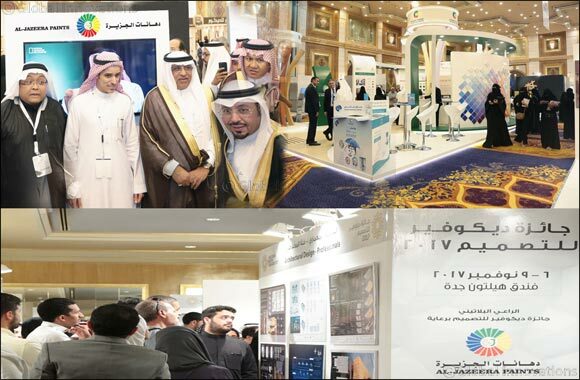 More than 120 exhibitors representing 10 Arab and foreign countries participated in furniture, lighting, design materials and services, home decoration, textiles, home automation systems, kitchens and sanitary ware, floors, designs and architectural services sectors.